- Finalist in Girls Division, Volcom Wild in the Park competition 20014 at Ormeau skatepark. Skateboarding is about fun, enjoying yourself and progressing at your own pace, and with positive encouragement. 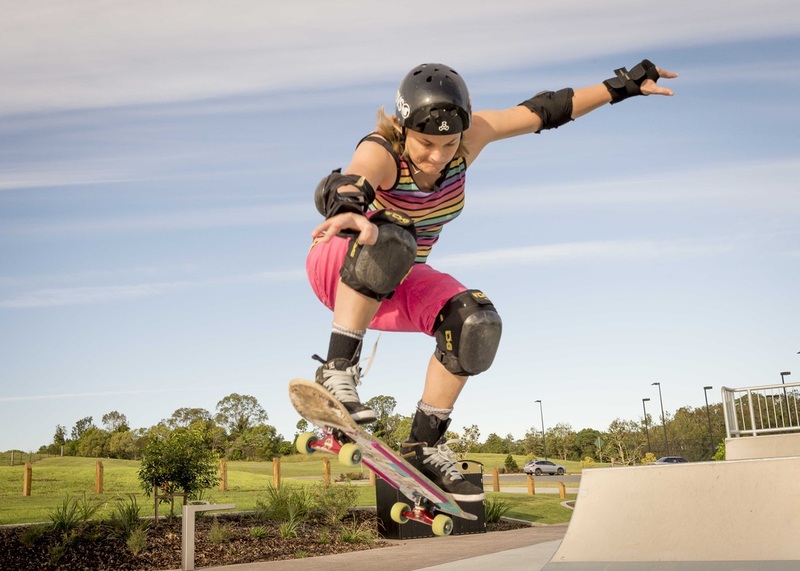 I am a female skateboarder who has been skateboarding for over 15 years and been coaching people of all ages, genders and from beginners to intermediate levels for several years now. Part of my personal philosophy and interests are in encouraging people who may not think they fit the profile of ‘typical’ skaters. From teaching a broad range of people, I know with the right encouragement that anyone can start skateboarding today. My students include female skaters, queer people and people who identify as transgender, mature age skaters, skaters of all backgrounds and body types, and youth from a range of backgrounds. I take a holistic approach, influenced by my background in social work, as a proud transgender woman and member of QLD’s queer community, in making sure every one I teach to skateboard feels validated, that they are respected and that we work together in creating a pace and space they feel comfortable with and that’s right for them. Most importantly, it is a priority to me that all students feel supported and encouraged to have fun and to just be themselves. How long are lessons? I recommend I hour minimum skate lesson for individuals, and 1.5 hours minimum for small group lessons. I can also do 2 hour to half-day sessions for individuals keen to advance, and recommend this time block for larger groups (up to 4 people). When can I learn? I am available at very flexible hours, including weekdays and weekends so I am sure we can arrange a time to suit both our schedules. How much will it cost? My fees for coaching are based on hourly rates of $30, but with a sliding scale to suit your budget and current financial status (including $20 for students, p/t and casual workers etc). If lessons are held outside of Brisbane, I ask for an extra contribution to cover my travel costs. In special cases, in the spirit of community, I am also open to exchanging various goods and services of equivalent value for coaching. The below levels are based on skills you can learn but it is not possible to indicate how long it takes to complete levels. It is always up to the student and their own style, confidence and capabilities if, and when they chose to move to a different level. Rolling with confidence - Level 1: Venue – flat ground. I always start students off with gentle five minute warm up exercises to get your body stretching and ready for physical sport. For beginners, we begin on the grass and cover basic essentials such as how to wear safety equipment, foot placement, how to stand safely on a board, and the importance of bending knees for agility and safety. Once you are comfortable standing on a board on the grass with correct foot placement and posture, we move to easy exercises on flat ground that will teach you to push and roll. Once you are comfortable pushing and rolling with assistance, you can then start rolling independently with a proper technique that will assist you to roll confidently and safely. Other tasks you can learn at level 1 include different ways to stop, slow your speed, and how to jump off your board, as well as learning to getting momentum without pushing. You will also learn some fun beginner tricks like tic-tacs and crab walks, which give you board control. With these skills, you can skate up to the local corner store and along pavements and boardwalks feeling free! Foundational tricks - Level 2: Venue – flat ground and skatepark. Students are shown more useful warm up exercises for injury prevention, learning skatepark etiquette and being introduced to new skate skills and tricks. This includes learning to pivot (or half cab) on flatground, how to roll down ramps, learning manuals and step by step introductions on how to Ollie, the essential trick for many skateboarding tricks. Students who are comfortable on the board may also be ready to learn how to drop in small bowls or quarters and kick turn on a ramp or transition wall. With these skills, you will be able to skate at your local skatepark, getting to have fun fun in a number of sections at the park and feeling free! Intermediate – Level 3: Venue –skatepark. Students at this stage will know how to warm up and have confidence skating in skateparks. Foundational tricks at this stage include learning 180s, pop-shuv its and how to do kickflips and heel flips. Mini-bowl or ramp training includes learning rock to fakies, 5050s and rock n’ rolls. Students who are keen to progress can also get advice on tricks such as 5.0s, disasters, tail and nose stalls, pre-grab tricks and ollies on transition. Street tricks can also include learning to grind ledges and boardslides on small flat bars. Advice can also be given on creating lines for competitions and making the most of your skills. I am available as a public speaker and MC for skate-related gender and sexuality empowerment projects, as well as being able to coordinate workshops around positive attitudes and behaviour towards female athletes. I am also a freelance filmmaker who has experience in making skateboarding documentaries and related television and media content. I am able to provide references and testimonials.